Visions of Jesus Christ.com - Maria Rumolda - Stigmatist. Above photo is of Sister Maria Rumolda with visible stigmata on her feet. 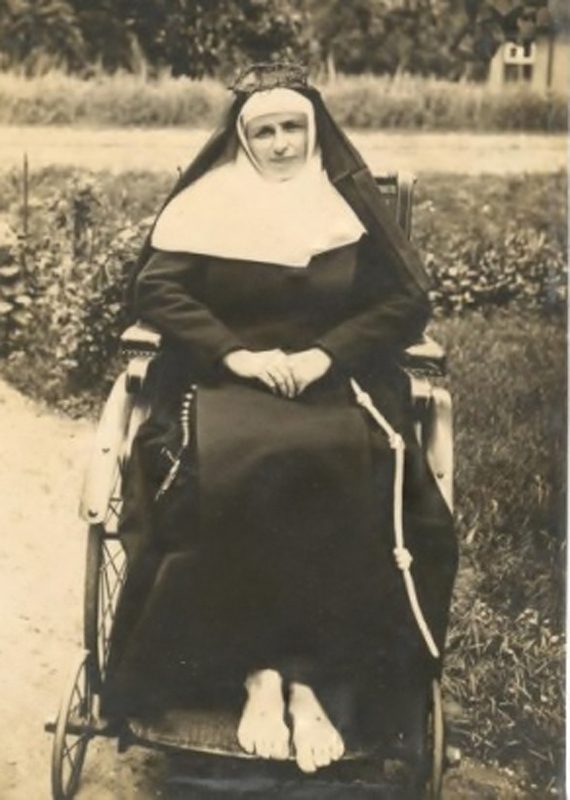 Sister Rumolda (Angelina Maria Rumolda Van Beek) was born in 1886 in Baarle-Hertog, Belgium. Dressed in her convent of the Franciscan Sisters to Herentals July 1920, professed July 3, 1921. Eternal vow July 3, 1924. In 1922 had a vision of the Sacred Heart and on November 18, 1922 had the stigmata or Holy Cross wounds in her hands and feet. Her body temperature hovered around 40 degrees. The doctors who examined Sister Rumolda explained that what they saw could not be explained. In a natural way the stigmata continued to occur until the sister fell asleep in the Lord March, 1948. Rumolda Sister was born in 1886 as Maria van Beek. She came from the very Christian family of farmers Kees Van Beek and Angelina Meyvis on Ginhoven. 'Mieke' was the fourth child of seven in a row. As a young girl she began a life of prayer and penance. She came regularly pray in the chapel of Ginhoven. At its 17 th year of life she indicated that she wanted to be, but nun out of duty she stayed home to help her parents. A brother and an older sister had already gone into the convent. Beware the age of 33 (in 1920) she joined the Franciscan Sisters of Herentals. A year later she professed under the name Sister Rumolda and in July 1924 she put her perpetual vows. From June 1922 she underwent severe physical and mental torture. In her hands, feet and heart region, the five Holy Wounds visible and from November 18, 1922 she was permanently stigmatized: the five cross wounds remained permanently visible. She died on March 13, 1948 and her grave in Herentals pressure is honored. People praying for years for a speedy beatification. Sister Rumolda wanted her working life as happy to spend in the religious mission of Congo. However, that did not happen. In October 1922 it appeared in a vision the Sacred Heart of Jesus. She was told at that time that they would be united and that her life would be sacrificed for the good of souls. Intimately with Christ the following months she felt growing pains in hands, feet and heart. Her wedding ring was engraved on a inexplicably on November 18, 1922 with the letters JUB: Jesus Your Groom. When taking her perpetual vows on July 3, 1924 she received in the presence of Cardinal Mercier mysteriously a second ring with the same inscription on her finger. Her body temperature fluctuated settled around 40 ° C. The five cross wounds remained permanently visible. Head, arms and legs often showed wounds of lashes. Never, however, began to fester the wounds. Every Good Friday they lived in ecstasy the torture and crucifixion of Jesus. Sister Rumolda suffered searing pain, but continued despite radiate everything for 26 years a great condescension. All these years she stayed at her convent room in Herentals. Sister Rumolda endured all this for devotion and is therefore regarded by the people as sacred. Rumolda: "Twice a year I was the nuns at the boarding 'on parloir', visiting aunt nonneke Rumolda. I then knocked at her door, went inside and saw immediately that she was in pain. I therefore saw her wounds, especially on her hands. That looked so like what swear off. Wounds that she had on her feet and in her side. I loved going to it. I talked a lot with her. It was a very dear aunt. She was particularly interested in my progress at school. Her brother came to her every month to do a wrong. When they received the communion, she was 'just' death. You could knock her over on her arm, but she did not respond. She then got called 'half ling' a smile on her face. Suddenly it was over done and you saw that her suffering came back. "In her room was a nice size H. Heart image. Rumolda'm sure the H. Heart to Aunt nonneke appeared. It is according Rumolda been the mission of God that they had to suffer for the sins of the world. Especially during Lent according to her she had a lot of pain. "After Lent we had to always play the" cour "and with a sister than was the report of which Rumolda sister had experienced during Lent told my parents. She then saw her blood cloths. " There is a [book] out on these events titled 'Sister Rumolda, the holy nonneke of Herentals' author Louisa De Busser. Flickr [photos] of book event.